Omar Badrin was born in Malaysia and raised in Newfoundland. As a transracial adoptee and member of a visible minority growing up in a predominantly white province, Badrin was frequently othered by those around him. This resulted in a warped self-perception that resulted from Badrin’s desire to belong and his frustration at not being able to. 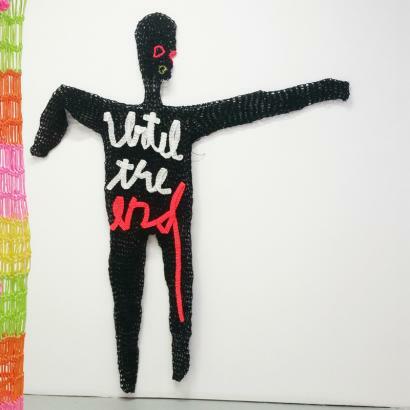 “Luh!”, is an exhibition of selected works that were created with his upbringing in mind. They are thoughts and reflections that are materialized through the use of crochet. For Badrin, crochet is a nod to Newfoundland culture and family traditions. His use of non-traditional artmaking materials such as industrial fishing twine and mason’s twine are symbolic of cultural influences and past work experiences. Badrin obtained his MFA at the Ontario College of Art and Design University (2015), where he was awarded a graduate medal for his work in the Interdisciplinary Master’s in Art Media and Design program. Since graduating, he has received project and travel grants from the Toronto Arts Council, Ontario Arts Council and Canada Council for the Arts. In 2017, Badrin received an Honorable Mention for the Melissa Levin Emerging Artist Award from the Textile Museum of Canada.